If you were expecting self-driving cars, robot chauffeurs or flux capacitors from Ford's CES 2013 keynote presentation, you may be a little disappointed. But the Blue Oval have revealed major upgrades to their SYNC AppLink voice-activated app platform, which allows you to operate smartphone apps via an in-dash touchscreen or your own dulcet tones. At their Las Vegas presentation, Ford announced the addition of nine new apps to the platform, falling into three core categories: news and information, music and entertainment, and navigation. Among the music apps were streaming services Aha Radio and Rhapsody, plus Amazon Cloud Player. The Wall Street Journal and USA Today both announced text-to-speech apps in which the latest news stories to you are read to you "by a real person," while the app Kaliki will read out other newspapers and magazines. Ford explained that the benefit of these apps was to bring the latest regional news, finance and sports content to your car — apparently overlooking the fact that the radio has done this for many years. 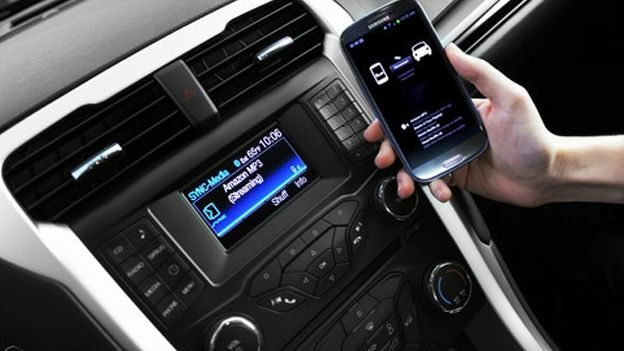 Perhaps most significantly, the American car company also announced that SYNC AppLink is taking a more open source approach, by opening the Ford Developer Program. In the name of safety, apps that use video, gaming or "rich imagery" will not be permitted on AppLink. So no fun stuff, basically. Developers will now find it simple to make their apps compatible with Ford cars, so expect plenty more UK-centric apps unveilings in the coming months.